Suzanne Hobbs’s professional interests include food and nutrition policy (domestic and international), dietary guidance policy, cultural proficiency in health services delivery, and health journalism and communication. Dr. Hobbs holds a doctorate in health policy and administration from the University of North Carolina at Chapel Hill where she is a clinical assistant professor in the Department of Health Policy and Management at the Gillings School of Global Public Health. 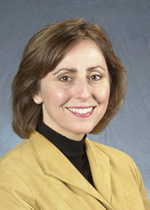 She is also the director of the Executive Doctoral Program in Health Leadership. Dr. Hobbs is a licensed, registered dietitian and Fellow of the American Dietetic Association. A professional health writer, Dr. Hobbs is the author of 10 consumer books, including Get the Trans Fat Out (Random House, 2006) and Being Vegetarian for Dummies (Wiley, 2001). Her diet and health column, “On the Table”, appears weekly in the News & Observer (Raleigh) and The Charlotte Observer. She is a member of several professional associations and has served on the board of directors of the Association of Health Care Journalists and the Center for Excellence in Health Care Journalism.